Stone Art can add a personal touch to any home or garden with personalized custom cut stone. Stone Art hand carves subdivision signs and entries to welcome all comers with enduring class. From V-groove embossed letters to relief carving, Stone Art can offer a new dimension in signage. 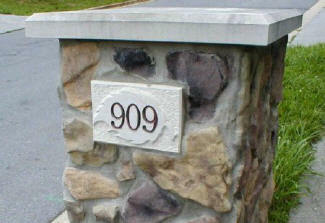 Stone Art will carve any address stone with anything from the house number to fully customized rocks. Stone Art will even personalize driveway columns. For extra personal touches, have your name carved in stone to welcome visitors to your garden or give it as a gift that will last for ever. All at affordable pricing and can be shipped anywhere. Lawn Stickers are engraved stones with stainless steal pins so you can stick them in the ground anywhere and move them easily. No installation required, relocate at will. 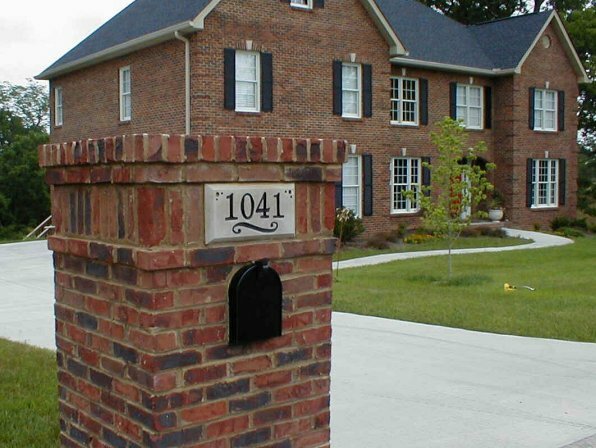 Highly visible address numbers, makes you easy to find. Easy to remove for mowing. Get in the mood with seasonal and holiday décor. We offer a wide verity of customized designs. So use you imagination: Grandmas Garden spot, Pet tombstone, Tributes, Address stone, customized with your favorite hobby, Sweetheart rocks, Dedication corner stones, All carved in stone two inches thick!